Reports of a newly-identified canine strain of circovirus have set many dog lovers on edge. According to the American Veterinary Medical Foundation (AVMA), the virus has been identified in at least one case of illness, but it has not yet been determined whether circovirus works alone or in combination with other pathogens to make dogs sick. Dog owners should be aware of the virus, but there's really no need to panic at this point. According to the Center for Disease Control (CDC), circoviruses are "nonenveloped, spherical viruses with a single-stranded circular DNA genome." These viruses aren't completely new. Different strains are known to cause wasting in juvenile piglets and beak and feather disease in birds. According to the AVMA, the canine strain was identified in June of 2012 as part of genetic screening to look for new viruses. According to the American Veterinary Medical Association, a full diagnostic work up is needed to diagnose the presence of circovirus, as well as any other pathogens that might also contribute to the illness. Postmortems, aka necropsies, should also be conducted on deceased dogs in cases where the virus is suspected. The AVMA states that there is currently no vaccine or cure for canine circovirus. Treating infected dogs involves giving them supportive care while their immune systems try to fight off the virus. 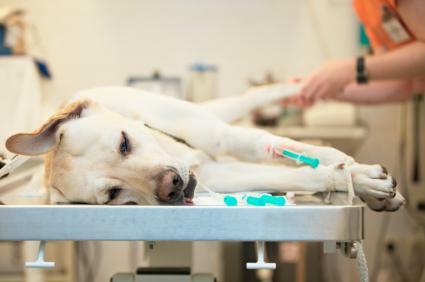 Administering IV fluids has been helpful in some cases, especially if the dog received care early, because it staves off the dehydration caused by the vomiting and diarrhea. According to Nancy Kay, DVM, veterinarians are not completely sure how the virus is transmitted from one dog to another, but they do suspect a dog can pick up the virus by coming into contact with the feces or vomit of an infected dog. More study is needed to determine if the virus can be transmitted through respiratory secretions, as it is with porcine circovirus. The AVMA and CVMMSU both corroborate that circovirus is not transmitted from dogs to humans. However, it's still a good practice for dog owners to wash their hands after handling their pets, especially sick ones, to make sure they don't transfer illness from one dog to another. To date, there have only been a small number of circovirus cases to study, so what is currently known about the virus may change as more information is gathered. For now, seek help from your veterinarian if your dog develops any of the symptoms since the dehydration they cause really poses the biggest obstacle to a dog's recovery.